Who wouldn’t buy this guy’s book? I’ve received some stern advice since putting up my Facebook page for Spell/Sword. I need to actually tell people about myself. I need to make it reasonably easy for people to know my name, my backstory, what feats I selected at character creation, etc. This is one of the many ‘Duh’ moments that I’m guaranteed to keep having as I explore the world of self-publishing. It makes total sense. Whenever I investigate a new book I immediately want to know who wrote it. Are they someone I would hang out with? Are they cool? Would they be nice to my dog? Most of the authors that I truly enjoy pass these simple tests — with a few making their way to coveted Birthday Party Status. I want them to come to my birthday party, so we can be Forever Friends. I need to start crafting my public persona with a little more care. I’m putting the book out there all on my lonesome, so if I’m EXTREMELY LUCKY a prospective reader may look at my personal details ONCE. I’m going to be updating the About page of the site here, and also putting up some personal information on the Facebook page. I have no words for that picture. One of the finer GRRM tribute pictures I’ve ever seen. Nice transition lenses. I never feel that way about writers. Well, I do want Stephen King to be my other dad. But I like my real dad, so they would have to enter into an awkward partnership that is better off not considered. I love writers for their minds: I don’t care where they went to school or how many kids/cars/dogs/vinyl toys they have. 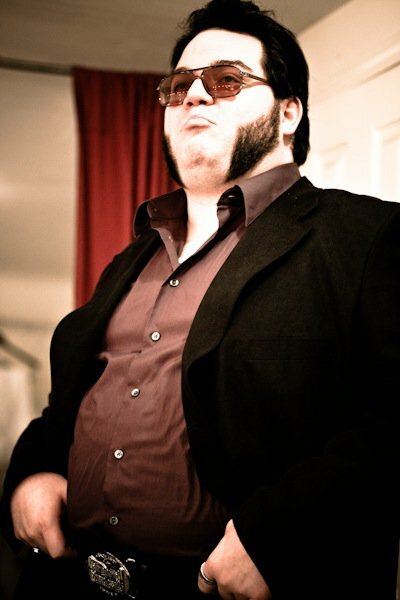 But those ‘chops…I donno, they’re pretty awesome. Excuse me, my neutered male cats are doing something awkward that my dad and Mr King should also never, ever, do. Ha, fair enough. This picture was from a show [Picasso at the Lapin Agile] where I played the Visitor — who’s supposed to pretty obviously be Elvis Presley. Sooooo…. Not really, really ‘you.’ Busted!